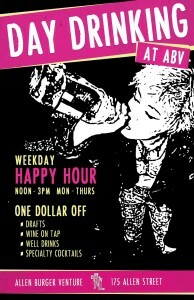 You are here: Home / Events / Day Drinking at ABV! Enjoy A Little Weekday Happy Hour. Stop by every Monday through Thursday from 12 – 3pm for Day Drinking @ ABV with one dollar off drafts, wines on tap, well drinks & specialty cocktails.